Malta is an island country in the Mediterranean Sea located about 50 miles south of Sicily. Valletta, the capital of Malta, is nicknamed Superbissima, or “most proud” because of its many impressive and ornate Baroque palaces, churches and gardens. The preservation and historic importance of Valletta resulted in the entire city being declared a UNESCO World Heritage Site. Valletta isn’t just for history buffs though. The city hosts many festivals throughout the year, including the Maltese Carnival in February, the Feast of Our Lady of Mount Carmel in July, and the Feast of St. Dominic in August. Even if you don’t visit during one of these events, you’re not likely to get bored in this beautiful city with its rich history. It may seem like traveling to a small island in the middle of the Mediterranean would be a complicated journey, but getting there is not hard, even with miles. While no U.S. airline flies to Malta, award seat availability is still good through the major airline alliances, especially during the summer season. Unfortunately, no airline flies nonstop to Malta from the U.S., so you’ll have to make at least one stop on your trip. You’ll fly into the only airport in the city, the Malta International Airport. 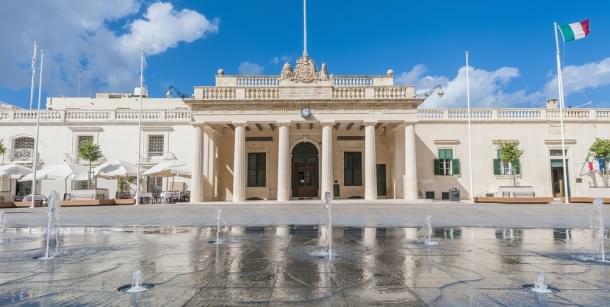 Locals often refer to it as Valletta Airport, since it’s located only three miles from the city. If you fly through London, you’ll likely have to change airports. Most U.S. flights arrive at Heathrow, whereas flights to Malta depart from Gatwick. You should also avoid flying to London on British Airways because of the airline’s very high fuel surcharges on long-haul flights. If you do fly to Malta on British Airways, try to use American Airlines to get to London first. Only one SkyTeam member flies to Valletta: Alitalia via Rome. First class tickets can’t be booked with SkyMiles. If you’re flexible with your travel dates, AAdvantage miles offer the best value for economy tickets during the off season. But if you’re flying in the summer, any of the major alliances offer the same price for coach. AAdvantage miles are also the best deal for premium cabins. You’ll save 25,000 to 40,000 miles in business class, and 35,000 miles in first. So start saving up your miles and get ready to explore the palaces and gardens of Valletta.